H.E. 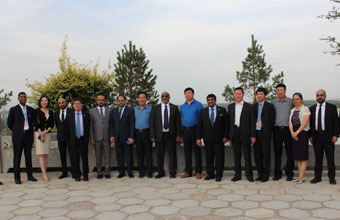 Yahya bin Said bin Abdullah Al-Jabri, Chair of the Special Economic Zone Authority IN Duqm (SEZAD), and his accompanying delegation, visited a company specialized in water desalination in Yinchuan Industrial Zone, which signed an agreement with Wanfang Oman Company for the implementation of a similar project in SEZAD as part of the Sino-Omani City. He was briefed on the company's potential to desalinate water from the Yellow River for use in industries located in Yinchuan Industrial Zone. During the visit, the company officials gave a detailed explanation of the company's capabilities and the quantity of water produced by the company and used in factories in the Zone.